Brunet-García tackles the largest 15K in the U.S.
Home > Blog > Brunet-García tackles the largest 15K in the U.S.
Each quarter, Brunet-García helps employees achieve their fitness goals by paying for participation in a walk or run of their choice as part of our employee wellness program. 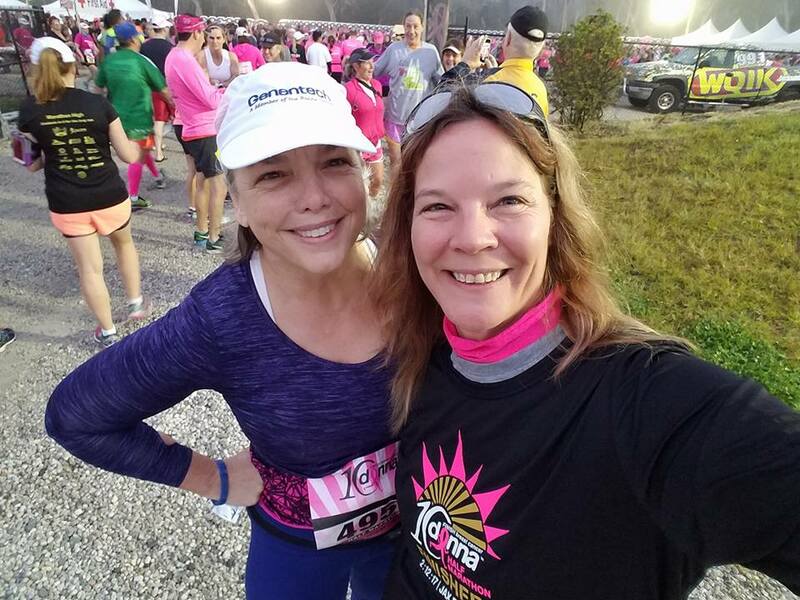 Diane Brunet-García and Thrude Legg are ready to run the Donna Marathon in Jacksonville, Florida. This March, several members of our team take on the largest 15K race in the United States, the Gate River Run (the Gate) in Jacksonville, Florida. Our participants range from avid runners to staff who are just beginning to add walking and jogging to their routine. As someone who has never taken part in an event like this, I wanted to learn more about the motivation behind taking on such a distance. The burning question, why are you interested in completing the Gate River Run? Have you participated before? Thrude: I’ve never felt like I had the endurance to finish it in the past, but I believe this year I’m ready. Yes, at 49 I’m finally fit enough to finish it. The Gate is an internationally known 15K. People travel from all over the world to participate. I am lucky enough to live in the city that hosts it, and I want to embrace that. Plus, what a sense of accomplishment it will give me! Christy Schell is a veteran of the Gate River Run. Christy: This is my favorite local run. I have run the Gate eight times so far. It is exciting with thousands of people running/walking it. My favorite part of the run is going over the Hart Bridge. It is the only race where they shut the bridge down; I have goosebumps now just thinking about it! I love the distance, too. I have completed 22 half marathons, but truthfully if I could just do 15k races it would be so much easier and more fun! Katy: I have never been interested or participated in the Gate before. I’m not even sure if I’m interested now! I am already hot and exhausted thinking about it … a little panicky even. I’m grateful my coworkers/friends will be there. I was promised a fun time and celebratory/recovery drinks. Fingers crossed. 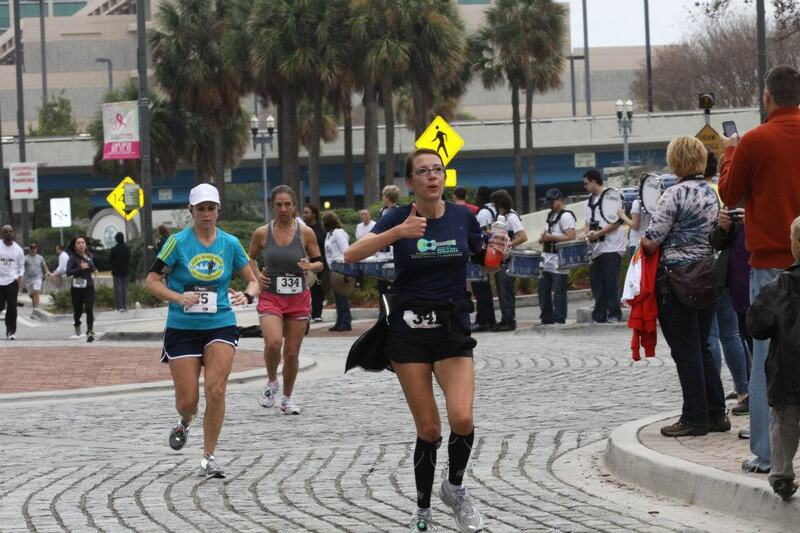 Leslie: I am interested in completing it because I would love to be a part of the largest 15K race in the U.S.! The energy downtown is contagious, and who doesn’t want to walk/jog for a couple hours and have 120 kegs of beer waiting when you’re done (or mid-race … hey, who’s lookin’)? Kate: To be honest, I have no idea. This will be my fourth year, and I’ve only been a “runner” since the first time I ran it. I am doing it again in hopes that the weather is cooler! 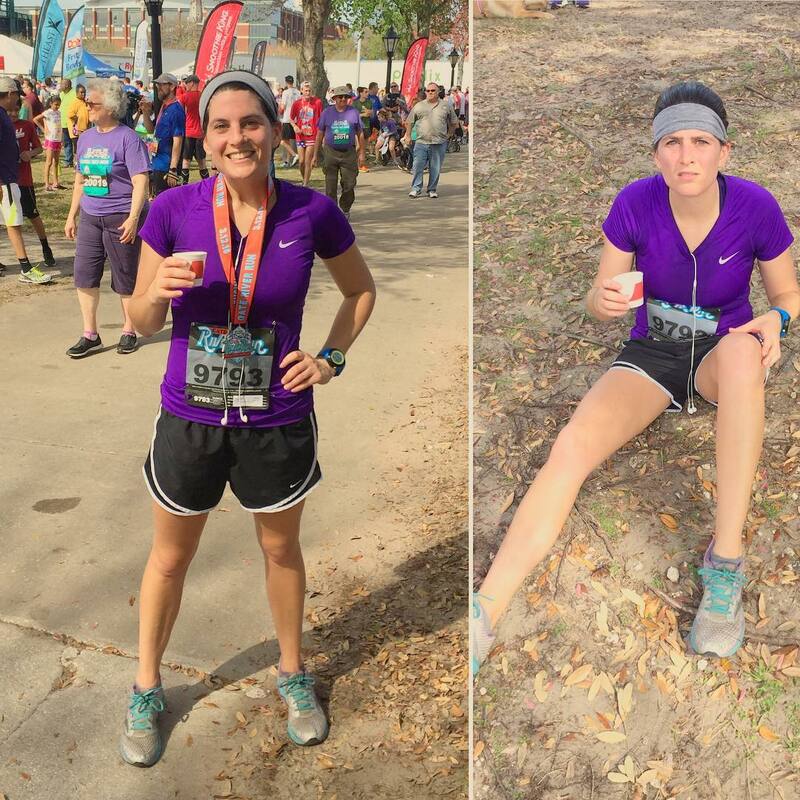 The race itself is super fun as long as you aren’t too serious about it—and it’s pretty hard to be serious about getting a good time when you are elbow to elbow with other runners for the first 2.5 miles. I love how spectators line the course with signs and “giveaways”—though I never actually take anything (grilled sausage on a stick doesn’t necessarily sound good to me on mile 5, but hey, to each his own). I do very much appreciate being sprayed with a water gun though, so don’t hesitate to aim that sucker my way. I also appreciate the live bands at every mile and will even take my earphones out and do a little jig as I pass, if you’re lucky and I don’t feel like I’m going to pass out at the moment. Running is all a mind game, so these “distractions” help push you through. Do you prefer running, walking or something in between (and why do you enjoy it)? Diane: I like it best when Kate and Thrude pull me in a wagon. Thrude: I prefer running if I’m alone, and a mixture run/walk when I’m with a group. I’m not like some runners who get a high from running in and of itself. I get a high off the sense of accomplishment whenever I’m finished running. When I’ve reached a goal I’ve been striving for … whether it’s distance, time, or a combination of both, it is a great feeling. I look forward to saying I have completed the Gate. My best accomplishment so far was running in the Ragnar Relay from Miami to Key West. Now that was a RUSH! Katy: I prefer running, but I will be doing a LOT of walking. The only thing I “enjoy” is the feeling of accomplishment when it’s all over and the smug Facebook/Instagram posts I plan on making pre-race. Leslie: I do like to run, but only short distances like one to three miles. This race will consist of a mix of walking and jogging for me. As the first ever multiple-mile race I’ve participated in, it will be crucial for me to pace myself. Kate: I prefer to run the entire way. I don’t judge myself on my time (again, it’s hard to get a good time with so many people on the course), but I do try to run the entire race without stopping to walk. It’s an immense sense of accomplishment for me … which lasts an entire year (until the next Gate when, for some reason, I feel the need to do it again). Kate Jolley demonstrates the fantasy and the reality of running the Gate River Run. Do you have any favorite routes around town? Thrude: When I lived on Gate Parkway in Jacksonville, I used to love running down the parkway to Town Center and running through the shops and restaurant area and back again. I would go early in the morning before most of it opened, and even in the summer months when it was hot as hades even that early in the morning … I would just be so excited when running past the Publix and the front doors would open and you’d get a “whoosh” of AC to help get you to the other storefronts that would provide shade when you desperately needed it. What a great run! Katy: I enjoy the Riverwalk, River Road, and the neighborhoods around San Marco in Jacksonville. Kate: I love running around my ’hood – Avondale Avenue through the shops of Avondale and then back behind the shops on Richmond Street to look at the houses along the river. I also like taking the Riverwalk from Memorial Park in Five Points through the Landing and back. 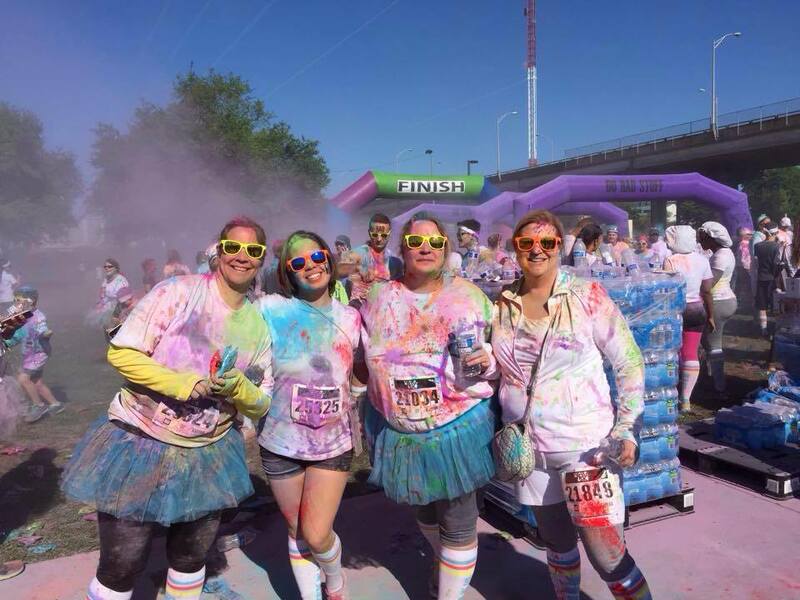 Thrude Legg and her friends celebrate after completing the Color Me Rad 5K. What would you like to tell your peers who are hesitant to start a run/ walk program or participate in a race? Diane: There is no shame in walking, particularly as we age. Walking is actually more conducive to meaningful conversation with friends and family, all while getting the exercise essential to staying healthy, centered and calm. Cassie: I’m probably one of the worst runners around, but the good news is that you can move at your own pace. You should surround yourself with peers who are super supportive and will motivate you. My friends and I have decided to run once a week after work as a start, and it has helped me develop a routine so that I don’t fall behind in my goal! Katy: Just do it, who cares? You have nothing to lose. Fast? Use the Gate as an excuse to treat yourself to some hot new running gear. Slow? There are a lot of walkers to keep you company, myself included. Single? Let the scantily clad men and women motivate you. My favorite? Hot dads with strollers. Kate: Believe me … I was NOT a runner. In fact, those who know me from high school or college literally laugh out loud at the idea of me running a mile, let alone 9.3 of them. One day, I got sick of the sedentary lifestyle and decided to try my hand (or feet) at it because it was something that I could do at any time and didn’t require me joining a gym or depending on others to come together for a “pick-up game.” It is actually fun and really satisfying to watch yourself move from only being able to run around a block to running mile after mile without stopping. This is not to say that I don’t have days where I feel like I’ve “lost it,” or I’m way more tired than I should be. But the good days and that “runner’s high” you always hear about makeup for the bad days. If I can do it, literally anyone can. Plus, when else can you get away with wearing neon shoes?